If you’re a little put off by the mention of Christmas this early in the year, hear me out. I’ve got a great idea for how you can really enjoy the season, bless your children or grandchildren and start a new family tradition all at the same time. I guarantee that the kids in your life are going to love you for it, too. But it requires some amount of preparation. That’s the reason it may appear that I’m rushing things a bit. Between now and Dec. 1, collect 24 different books that are in keeping with your family’s holiday values and beliefs. You can find books at thrift stores, library sales, bookstores and online. 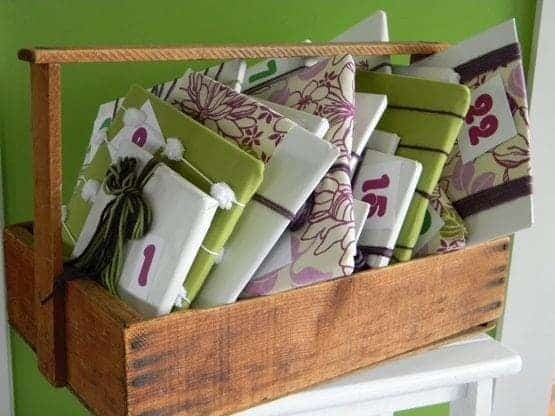 Wrap each book as a beautiful gift. Place all 24 gifts, marked only with a number between 1 and 24, in a large basket or festively-decorated box. Keep all of the wrapped gifts hidden until Dec. 1. Each night before bed allow the children to select and open one of these “gifts” that corresponds with the date on the calendar, then read it together. Repeat each night through Christmas Eve. Put the books away in a secret place and you’ll be ready to go again next year—and every year—starting with Step 2. What makes this an excellent tradition is that it is to be enjoyed over a three-to-four-week period. It fulfills the longing in all of us for an evenly paced holiday season. There are three basic types of Christmas books for children: books about the Nativity—some based on the Bible, others on legends; books about Santa Claus, gift-giving, and the like; and books that relate to one or more of the above but don’t quite fit into any category. In order to decide what type of book you want, it’s best to take the time to read through books that interest you or to read reviews before you buy children’s Christmas books. Don’t have money available to invest in books? Perhaps you can borrow books from friends or relatives. Or put together your list at your public library, then make your reservations early so you can pick them up right after Thanksgiving. Make sure you know your library’s renewal policy. Many libraries will renew books by phone or online. With weeks to plan, you have a world of possibilities for locating just the right books for your family. Search garage sales, used bookstores and other resources. New Christmas books are available in retail bookstores everywhere starting in early November, but you will have a short window of opportunity. However, you can shop online any time of year. Each title below has a link to Amazon, which will make it easy for you to click through to read more about the contents of the book as well as reader reviews. While this project is perfect for families, it can be easily adapted by grandparents, teachers, and libraries. No children in your life? This is a project you could put together and then send to a family in a faraway place that would not otherwise be able to celebrate Christmas every day during December. Get creative with where you’ll read these wonderful stories. One idea is to keep favorite blankets piled near the fireplace. The more special you make this daily event, the more traditional it will become for your family. Can’t imagine how you’ll ever find the time to research and review kids Christmas books? Over the years I’ve spent a lot of time researching, reading, collecting and asking for input from lots of people who love Christmas and books. I’m happy to share my list. There’s no time to waste. December will be here before we know it. The Story of Holly and Ivy, by Rumer Godden (Puffin, 32 pages, ISBN 978 0142416839). Orphaned Ivy finds her Christmas wish fulfilled with the help of a lonely couple and a doll named Holly. The Best Christmas Present of All, by Linda Jennings (Puffin, 32 pages, ISBN 978 0140566468). After his elderly owner suffers a heart attack, Buster the dog is sent to live with the man’s grandchildren and in the confusion tries to return home. Peef the Christmas Bear, by Tom Hegg (Waldman House Press, 48 pages, ISBN 978 0931674266). A Christmas teddy bear made by Santa comes to life and yearns to belong and bring happiness to one small child. Room for a Little One, by Martin Waddell (Margaret K. McElderry, 32 pages, ISBN 978 1416925187). ‘Tis the eve of Christmas—a cold winter’s night—when Kind Ox offers to share his stable by the inn. The Fourth King: The Story of the Other Wise Man, by Ted Sieger (Candlewick, 48 pages, ISBN 0763631213). The story tells us of another wise man beyond the well-known three. Every time he tries to catch up with the three wise men, he would encounter a situation where he needs to help a person or people. The Tale of Three Trees, by Angela Elwell Hunt (Cook Communications, 25 pages, ISBN 978 0745917436). Three trees dream of what they want to become when they grow up. Their dreams come true in the most unexpected of ways as one becomes the manger, another Christ’s boat, and the third the cross upon which he was crucified. The Christmas Child, by Max Lucado (Thomas Nelson, 48 pages, ISBN 978 0849917684). This Christmas treasure, formerly titled The Christmas Cross features the story of a Chicago journalist who discovers the meaning of Christmas. Christmas Miracle of Jonathan Toomey, by Susan Wojciechowski (Candlewick, 40 pages, ISBN 978 0763636296). A tender, elegant and poignant story about the spiritual reawakening of a bitter man. The Best Christmas Pageant Ever, by Barbara Robinson (Harper Collins, 128 pages, ISBN 978 0064402750). A hilarious and touching story of the transformation of the Herdmans, the worst kids in the history of the world. Christmas becomes new and real in some pretty surprising ways. Eight Nights of Hanukkah, by Michael J. Rosen (Scholastic, 32 pages, ISBN 978 0439365741). A story written from a child’s perspective about how one particular family celebrates Hanukkah. The Polar Express, by Chris Van Allsburg (Houghton Mifflin, 32 pages, ISBN 978 0395389492). A little boy who still believes in Santa takes a magical train ride on Christmas Eve to the North Pole. Merry Christmas Mom and Dad, by Mercer Mayer (Random House, 24 pages, ISBN 978 0307118868). Trying to be good for Christmas without bungling everything is difficult for this little one. A Pussycat’s Christmas, by Margaret Wise Brown (Katherine Tegen Books, 32 pages, ISBN 978 978 0061869785). A Pussycat Christmas is made up of sights and sounds that capture the mystery and beauty of the holiday. Littlest Christmas Tree, by Janie Jasin (Book Peddlers, 32 pages, ISBN 978 0916773816). The smallest seedling on the tree farm dreams about the things she could become and realizes becoming a Christmas tree is one of the many options. The Berenstain Bears Meet Santa Bear, by Stan and Jan Berenstain (Random House, 32 pages, ISBN 978 978 0679805939). Sister Bear enjoys Christmas preparations, especially getting her list ready—but on Christmas morning she realizes what Christmas is really all about. The Nutcracker, by Susan Jeffers (HarperCollins, 40 pages, ISBN 978-0060743864). An engaging treatment of a classic story that is not just a Christmas story, but a wonderful parable for every season. Morris’ Disappearing Bag, by Rosemary Wells (Puffin Books, 40 pages, ISBN 978 0142300046). It’s Christmas Day and Morris is missing. This warm and humorous story proves that sometimes the littlest bunny gets the last laugh. How the Grinch Stole Christmas, by Dr. Seuss (Random House, 64 pages, ISBN 978 0394800790). The Grinch, whose heart is two sizes too small, hates Who-ville’s holiday celebrations and plans to steal all the presents to prevent Christmas from coming. To his amazement, Christmas comes anyway. Max’s Christmas, by Rosemary Wells (Viking Juvenile, 32 pages, ISBN 978 0670887156). Max, the irrepressible bunny, sneaks downstairs to wait for Santa with unexpected results! Red Ranger Came Calling, by Berkeley Breathed (Little Brown, 32 pages, ISBN 978 0316102490). A cynical young man, the Red Ranger of Mars, meets his match in a retired Santa. A Christmas Carol, by Charles Dickens (Sterling, 96 pages, ISBN 978 1402766909). Probably one of the most beloved Christmas stories in history, this has it all: heroes, villains, ghosts, time travel: long-lost love and a happy ending. You may want to opt for this condensed version of the full-length book. Littlest Angel, by Charles Tazewell (Ideals, 32 pages, ISBN 978 0824955755). Adapted from the 1946 original about a cherub and his present to the Son of God. A Charlie Brown Christmas, by Charles Schulz (It Books, 128 pages, ISBN 978-0762416011). Everyone is getting into the Christmas spirit—except for Charlie Brown. It seems like everybody has forgotten what Christmas is truly about. Note: This is the mini book and so sweet. It contains the whole story, and kids love its tiny-ness. The Night Before Christmas, by Clement Clarke Moore (Applesauce Press, 44 pages, ISBN 978-1604332377). One of the many variations of the classic story, with delightful illustrations by Charles Santore. Question: What is your family’s favorite holiday tradition?